The initial Ghost mini-series by Kelly Sue DeConnick was enjoyable, but lacked some of the substance I was looking for from the writer. With some Ryan Sook interiors, it is worth taking another look at the title, just for the cover alone. The setup of the reality show was interesting, and a facet that many other titles seemingly lack. The series has an interesting tone that is caught between the ethereal and urban decay of Chicago, that makes everything in the book quite interesting and caught with two different parts of the Universe. The continuity on the initial mini is glossed over on the first installment, that seemingly makes it a mixed bag. Kelly Sue really steps on the toes of Ryan Sook in this title, by not letting him breathe more, he is an exceptional artist that can tell a story with little guidance from a writer. The cover shows something that few people in the industry can do, then DeConnick steps on his toes. A positive aspect regarding the series, is how easy it is to get a grasp on the character just from the well written dialogue from the opening pages. Other than the that, her characters lack the development they need. The dialogue is fun and snarky, but the different characters seem to fall on their respective faces. This is still of the same quality from the initial mini. There is no aspect that sets the story apart from standard superhero fare, save for the art of Sook. One bright point, is the joint supernatural and modern flair seen in the book. Still, other places in entertainment have been doing this sort of things years with video games like Devil May Cry. Sook really does go all out in this issue to some wonderfully dynamic effect. He nails the different mythical creatures and ghosts permeating the book, while everything is quite elegantly displayed throughout as to not crowd the eye. While page layouts can look a bit uninspired at times, the artist has a knack for clean and concise storytelling unlike anyone else in the business today. There is a reason why he is one of the artists most sought after in the modern comics industry. Dave McCaig does a good job on the colors, but stinks to all of his normal conventions that make him so easily recognizable. Even with his familiar colors, McCaig still does a great job separating the more dangerous environments of the supernatural from the glistening city-scapes. This is one of the best parts of the story. 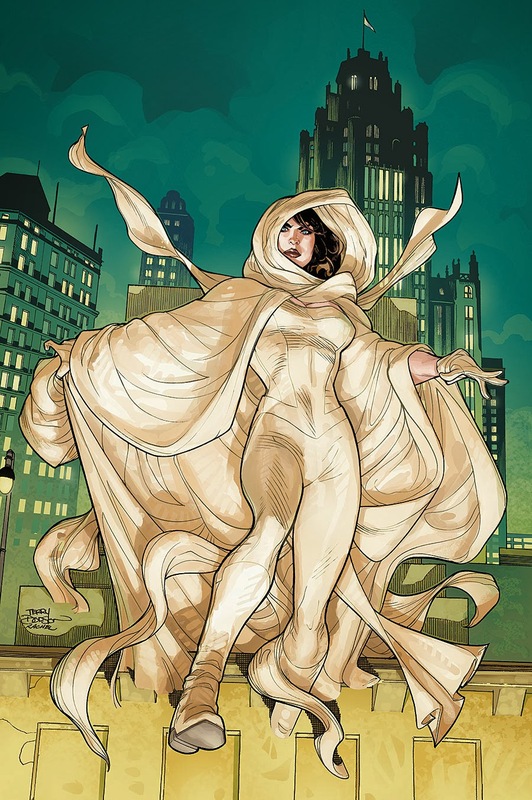 While Ghost is a fine story, DeConnick does not do anything that crosses remotely into greatness. Readers could find a more bold use of their time with something else on store shelves, like the same writer’s own Pretty Deadly. This first issue is a mixed bag, but those searching for a platform for Ryan Sook to deliver some great pencils may want to explore these pages. Ghost may not be the most consistent thing on store shelves, but the first issue looks truly beautiful.